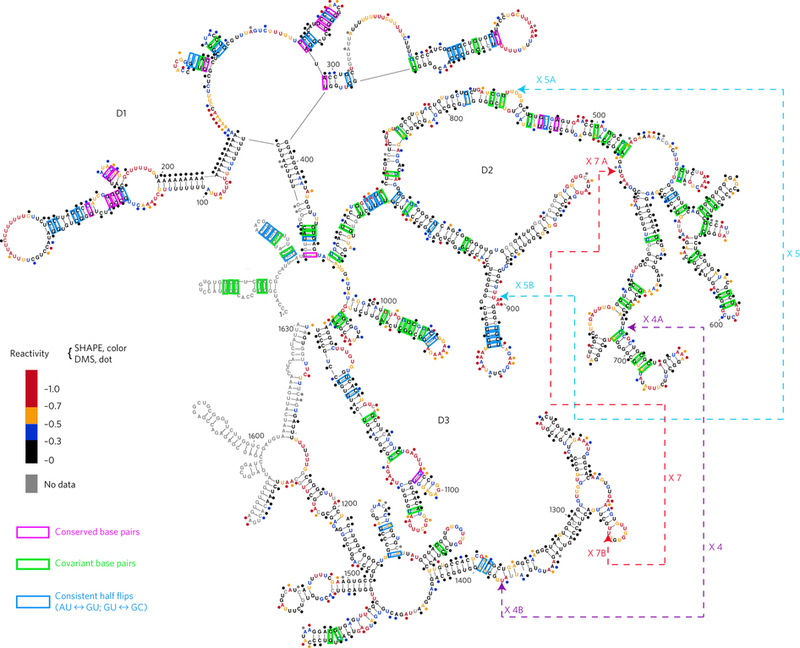 Long noncoding RNAs (lncRNAs) are important for gene expression, but little is known about their structures. RepA is a 1.6-kb mouse lncRNA comprising the same sequence as the 5′ region of Xist, including A and F repeats. It has been proposed to facilitate the initiation and spread of X-chromosome inactivation, although its exact role is poorly understood. To gain insight into the molecular mechanism of RepA and Xist, Yale University researchers determined a complete phylogenetically validated secondary-structural map of RepA through SHAPE and DMS chemical probing of a homogeneously folded RNA in vitro. They combined UV-cross-linking experiments with RNA modeling methods to produce a three-dimensional model of RepA functional domains demonstrating that tertiary architecture exists within lncRNA molecules and occurs within specific functional modules. This work provides a foundation for understanding of the evolution and functional properties of RepA and Xist and offers a framework for exploring architectural features of other lncRNAs. SHAPE reactivities are depicted by colored nucleotides. DMS reactivities are represented by colored dots over the nucleotides. SHAPE and DMS reactivities are denoted with the same color codes, as illustrated in the key. Highly reactive nucleotides are indicated with red and orange, and nucleotides with low reactivities are displayed in black or blue according to their reactivity values. Covariant base pairs in 56 mammalian sequences are highlighted in green, consistent half-flip pairs are highlighted in blue, and conserved base pairs are highlighted in pink. UV-cross-linked nucleotide positions are indicated by arrows with dashed lines. The secondary structure was drawn with VARNA (http://varna-gui.software.informer.com/).